I’ve come to the realization that my memory has suffered a setback that doesn’t seem to be recoverable…and it’s incredibly depressing to me. I have long found pleasure in the thoughts, experiences, moments and people stored in the vast section of my memory. I’ve worked in customer service with pretty much every job I’ve had, and took pride in remembering my customers. The first time I ever noticed that there were blank spots in my memory where it was once filled was in 2005 after I had back surgery. The area of my memory that was most affected was people’s names. I would know the person but couldn’t recall their name immediately, and this would be people I interacted with on a regular basis, though not daily. I had read that there are long term effects of anesthesia, and that I was probably experiencing a setback because of that. It was true, because my memory did bounce back about 6 months later. People laughed it off and told me that it was also due to getting older. I had surgery again last year and anticipated that it would happen again, and it has, but it’s not coming back. It’s been 10 months, so maybe this round of anesthesia is taking longer to wear off. I really don’t know. I am having a hard time remembering things that I should remember. Sure, some things might be minor details, but I feel that I NEED those details. I need to remember conversations and events and plans and whatnot. It’s important to me! There are some times where I don’t even remember any part of a conversation. So to combat this, I am going to TRY to make the time to journal every day in my handwritten journal to remember the details of the day so that I always have them. I thought about the pros and cons of handwritten versus computer, and I’m hoping that actually writing it down will help my memory retain the events better. Of course, writing them on my computer or a phone app or whatever would make them easily searchable, so we’ll see how it all goes. What I write will most likely be more about the day’s events and less about my feelings, which is what I usually use my handwritten journal for. I don’t want the idea of writing daily to be burdensome, so I’m going to come up with a few prompts to answer every day and plan for maybe 5 to 10 minutes of my time. I also found someone who has 365 Daily Prompts to record every day for 5 years. I’m thinking about maybe answering that prompt every day, as well. How is your memory? What do you do to help remember things? Because every moment of my life has to have a back story (ask my husband), I must fill you in on a few things before getting to the really good stuff. For the past 10 years (or so), David has attended the Microsoft Management Summit for business, and for the past 5 years I’ve tagged along for pleasure. The conference has been held in Las Vegas for at least the past 5 years, so last week was my fifth visit to Las Vegas. The excitement of a new city to explore has waned a little bit each year, but now it’s turning into a more familiar city that I get to re-visit now and still find new adventures. Every year we count our blessings that we get to go another year, so I am definitely NOT complaining that the conference has been in Las Vegas every year. Plus, we have friends who live in Vegas, so it’s extra nice to be able to visit them. 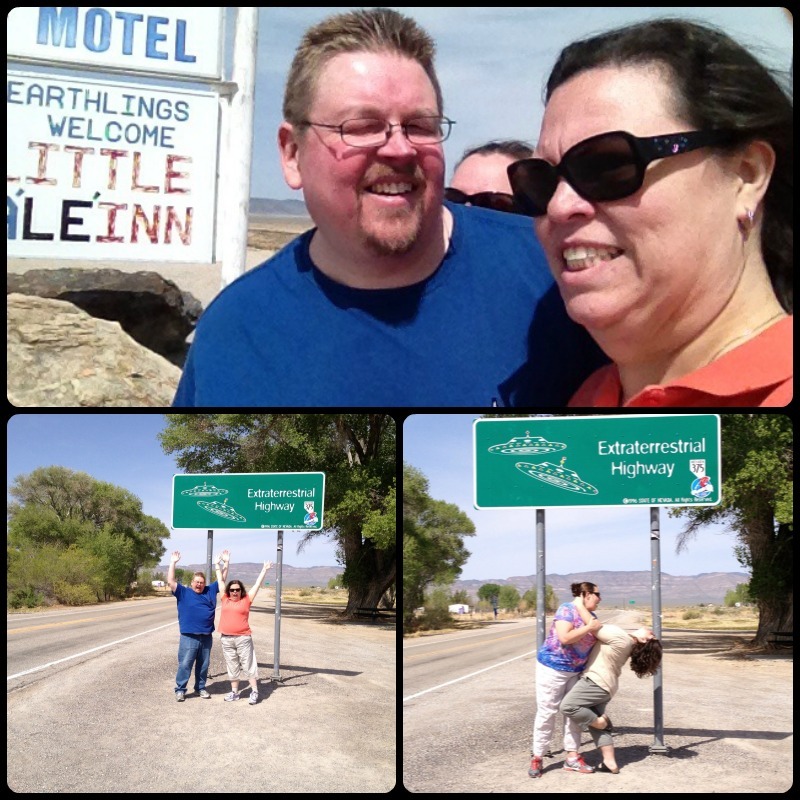 The conference began on Monday, but we flew in on Saturday, and picked up two of our friends to drive about 90 minutes north of Las Vegas to Alamo, Nevada. 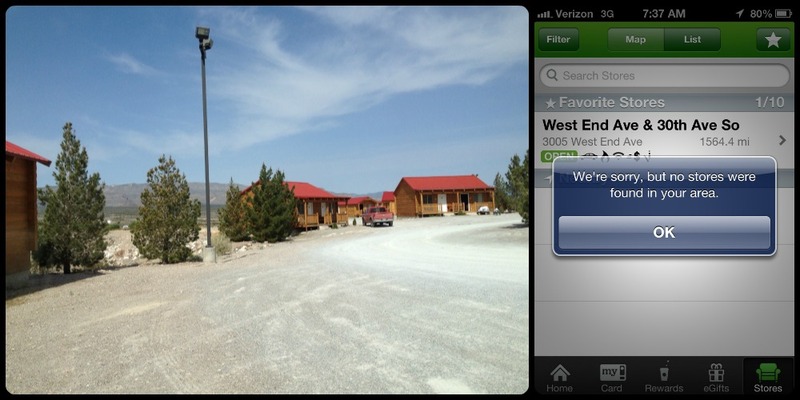 Do you know what’s in Alamo, Nevada? Not much! There’s a few places to stay, a tiny little town of modular-looking homes, a couple of gas stations, a cemetery, two places to eat (one of which is open when the owners feel like opening), and a public hot spring. The place we stayed was also the only restaurant in town that had set hours, so we pretty much ate there most of the weekend. It was cool at first, but it got old really quick. 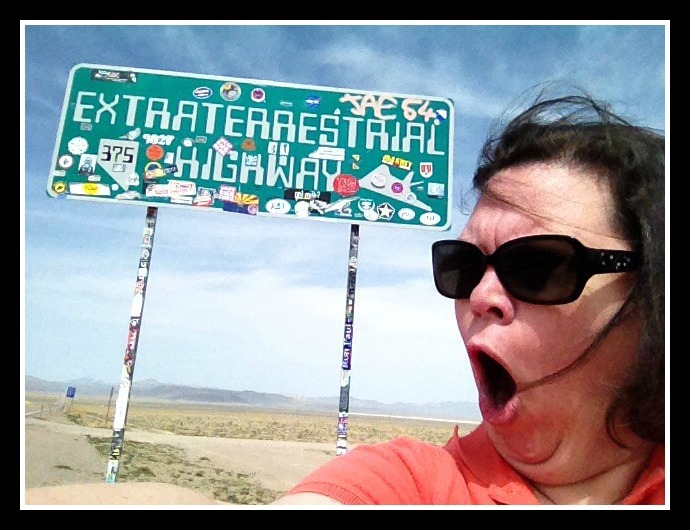 On Sunday we drove another hour northwest along the Extraterrestrial Highway to Rachel, Nevada, which is about as close as civilians can get to Edwards Air Force Base, otherwise known as Area 51. 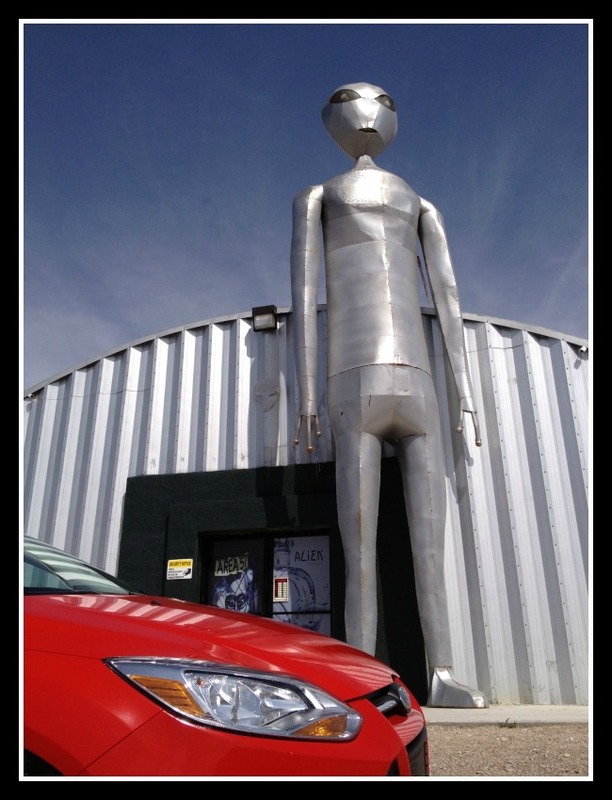 You can Google Area 51 and read all about it on your own without me giving you all the details, but for the purpose of my story (and to keep you from meandering away for too long), Area 51 is supposedly where the government is hiding the aliens…or something like that. 1. I can survive a weekend being nowhere near a Starbucks and/or modern civilization. It helps that I packed an electric kettle and some Starbucks Via. If you want to call me a cheater, then you can also call Boys Scouts cheater for always being prepared. I do give them credit for decent cell reception MOST of the time! 2. We probably should have worried that the Alien Research Center was abandoned on a day when it was likely to get the most business, and there was a lone RV out back with no signs of recent activity. 3. 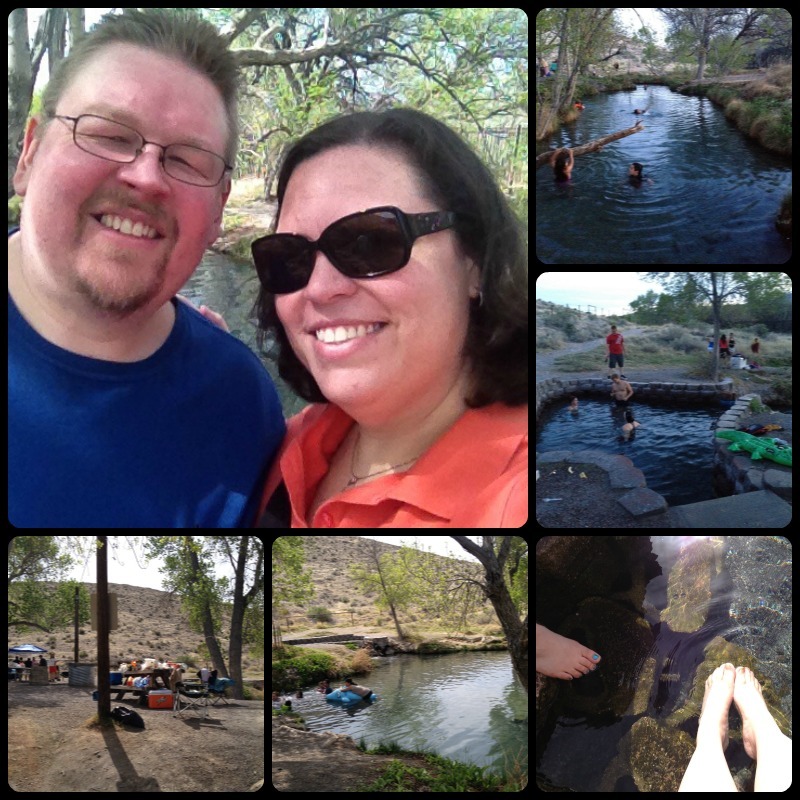 When there is little entertainment venues for millions of miles around, the Ash Springs hot springs is THE place to have your picnic/pool party/ hot tub/family reunion/dating game/weekend getaway. Plus, it feels really awesome! 4. 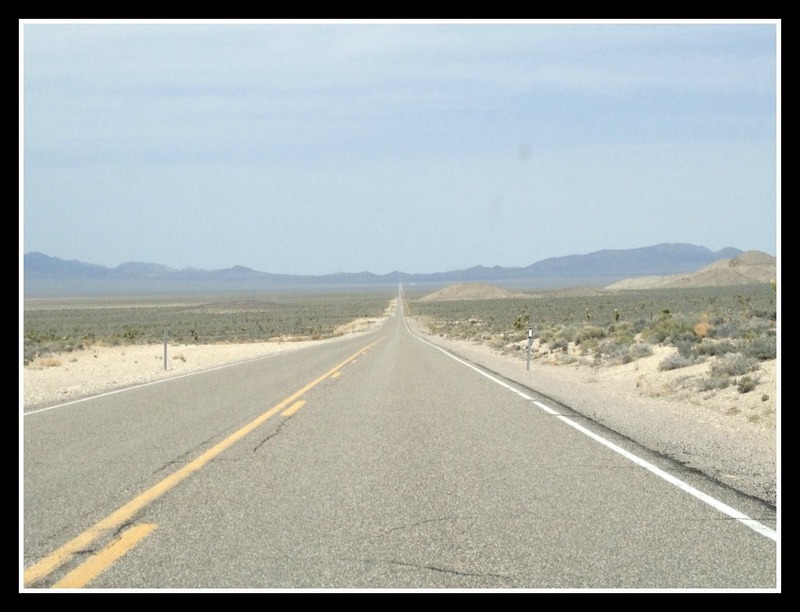 When driving along the flat, empty desert, driving 100+ MPH really fast doesn’t feel as awesome as it does when driving 100+ MPH really fast while passing cars and flying by road signs, or so I imagine. It mostly feels the same as driving 50MPH, I assume. 4. 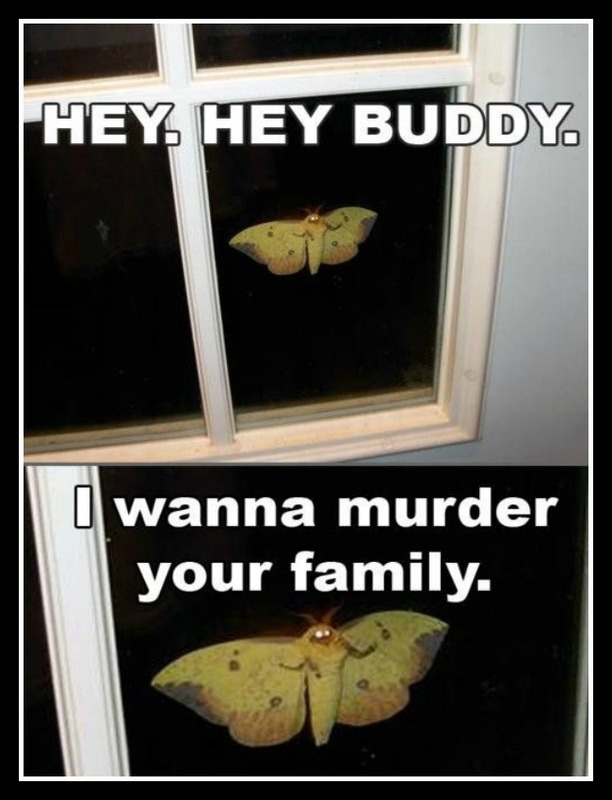 There are moths out to kill you. I REALLY wish I had a photo of one of the MANY that we saw, but pretend that I took this, because this is how they make you feel! 5. 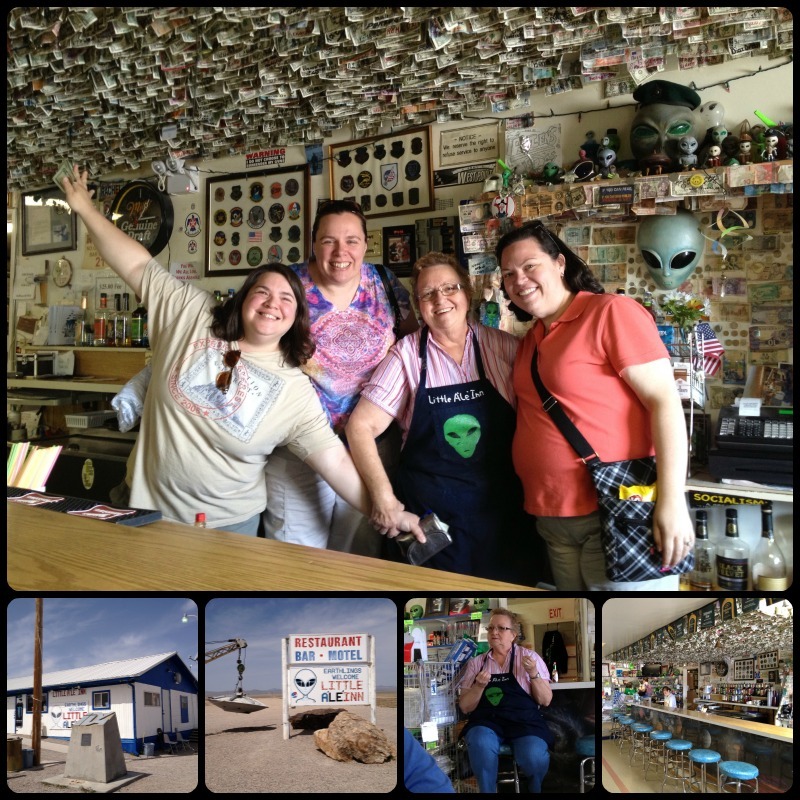 Random strangers who work for JackFM who are also on a trek to find aliens are a lot of fun, and they won’t think twice about following you 10 miles down a dirt road to the Area 51 gate or posing for pictures with you. People on Alien Quests are all completely normal people and should be trusted. 6. The lady who runs the Little A’Le’Inn tells amazing stories and turned out to be the true highlight of the entire Alien Quest, and she doesn’t think twice about asking you to step behind her bar for photos, probably because she’s met THOUSANDS of weirdos just like us! Her name is Pat! 7. The cake is a lie. 8. Bring AND wear lots of chapstick. No, not for the aliens! Wear it for the wind, because it’s incredibly windy out in the desert, and later you’ll wonder why your lips are so chapped. Besides, the aliens might be nicer to you with smooth lips. Maybe. 10. 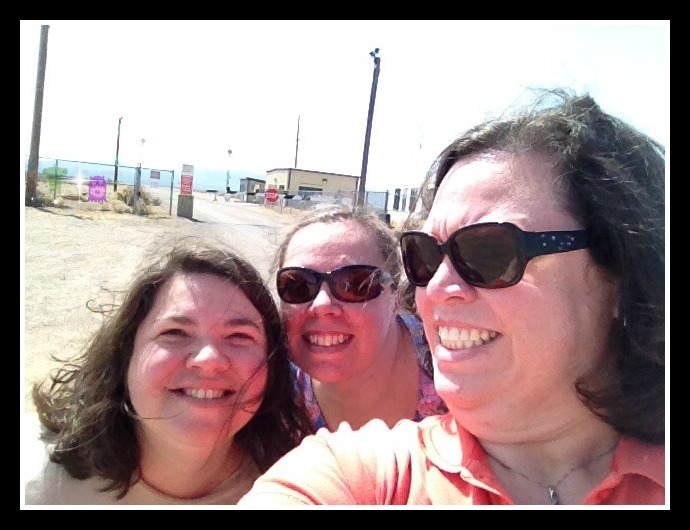 Trips to the middle of nowhere are much more fun with awesome friends! Stay tuned for more Las Vegas adventures! It seems the more I feel like I should be writing, the less I feel like writing. I am thankful that writing is not my full time job, because I’d definitely go hungry. I admire people who can write for a living and glad that they do, because it gives me so many awesome books, short stories, essays, blog posts and articles to read. I’m also pretty sure that the idea that “OMG I HAVE TO WRITE” is what kills my writing creativity and desire. On my writing to do list lately, in addition to blogging, is writing some book reviews and Yelp reviews. I sat down to write a book review, and hit the wall. I tried writing something, but my heart wasn’t in it, so I put it aside. I hate waiting awhile to write book reviews, because the more I get into reading another book, the details from the book I need to review start sinking back into the recesses of my memory, and I start feeling like I’m not doing the book review justice. Seriously, the guilt in writing sometimes kills me, and I know it shouldn’t. I got some Yelp reviews in yesterday, and that seemed to help get the writing juices flowing again, so here I am! I’ve looked into using writing prompts again like I did in the fall, but they don’t seem interesting to me. I feel certain that this block is all due to the time of year it is for me, because I am always incredibly despondent this time of the year. It usually begins in January and lasts through February or March. When spring arrives, I come out of my shell. SAD (Seasonal Affective Disorder) lights don’t seem to help much. Every year I have to remind myself that it’s just an annual phase in my life, and things DO GET BETTER. But still, the constant sadness and depression usually starts to creep in and tell me lies that I’ll be stuck this way forever. I know the depression demons tell lies, yet it doesn’t stop me from believing them at times. Usually the writing that ends up winning, in these cases, are the ones where I just pour out my heart and soul, letting anything that comes out make it on the screen or on the paper. You know, like I’m doing now. Just like the quote below says, any writing is better than nothing at all. What do you do to combat the writer’s block? Are you affected by Seasonal Affective Disorder? 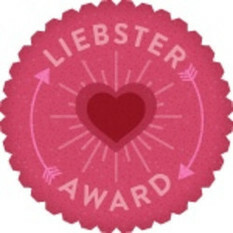 I was surprised this weekend to find a message in my Inbox that I had won a Liebster Award…? Yes, that’s a question mark. I had never heard of it before this weekend and quite honestly thought it might be something like a chain letter in blog form. Well, maybe it still sorta is in a round about way, but it’s cool nonetheless that someone thought to recognize me! I admit, I’ve been struggling lately that my blog has little significance in the wide world of the web, and my inspiration has been waning. Maybe this was one of those serendipitous gifts that happen in life. 1. List 5 facts about yourself. 2. Answer 5 questions given to you from your nominator. 3. Create 5 new questions for the bloggers you nominate for the award. 4. Chose 5 bloggers with 200 or less followers to nominate. I identify as an introvert because I require a large quantity of time at home doing my own thing or being alone. It doesn’t mean that I am antisocial, dislike people or don’t like to talk. I am actually very much a people person, but I do have limits. I do, however, hate talking on the phone except when I am in a car for long periods of more than 10 minutes. I randomly met my husband online through LiveJournal 10 years ago tomorrow (February 11th). He posted about the Pancake Pantry, which was across the street from where I worked at the time. In 2003, it was rare to find someone online within such close proximity to you. I was married to someone else at the time, and we were just friends until 2008 after my divorce. He was the guy friend giving me dating advice, and before we knew it we were dating! February 11th has been Pancake Day for us every year since we started dating. We married on Leap Day last year, so February is a big month for us. My birthday is Valentine’s Day, and I LOVE it! My mom’s birthday is Independence Day, and she LOVES it! I am often an open book, maybe too open. I really don’t keep a lot of secrets and tell people pretty much anything if they ask. Sometimes they don’t even have to ask, and I tell too much! I am good at keeping other people’s secrets but not so good at keeping my own. For the longest time (at least 20 years), I claimed to be 5’6″. In all that time, I was never truly measured until last year when I was measured at 5’5″ by two different healthcare providers. This has bothered me more than gray hair, getting older and any time that I gained weight. I’m not sure if I shrunk an inch or I was inaccurately measured in my teens. What topics do you find yourself blogging the most about? 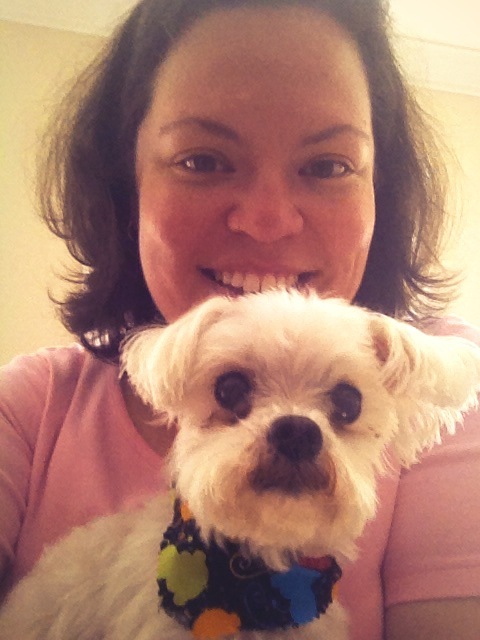 I usually blog about writing, being an introvert, reading, my faith and my health. Is blogging a pass-time for you, or have you made it a part of your career? It’s definitely a hobby for me. I have considered trying to write professionally, but I fear that I will lose interest if it becomes required for me. What’s your number 1 guilty pleasure? Reality shows about alternative relationships and lifestyles, such as 19 Kids and Counting, Sister Wives and The Little Couple. Reality game shows hold no interest for me. Having the courage to better my life instead of sticking to what I know. This has happened at least twice in my life, so far. If you could prevent one thing from happening to you in the past, would you be a completely different person today and would you rather be that different person than to have lived through whatever thing had happened to you? Oh, absolutely not. I truly believe that things happen for a reason, and that if those things hadn’t happened to you, then you wouldn’t be the person you are today. I often use my divorce as an example of this. If I hadn’t been in the relationship with my ex-husband, I wouldn’t be the wife to David that I am today. I had to go through that season of my life to be in the season that I am in today. Besides writing, what other hobbies do you feel lets your creative side shine? Is there someone in your past you wish you could reconnect with but either can’t find that person or are too afraid to reach out? What’s your favorite Starbucks drink order? If you’re not a Starbucks fan, then what’s your favorite dish to order at a nationally recognized restaurant? Or you can answer both! What is one trait from a parent, relative or guardian that you are glad was passed onto you? This can be physical, emotional, personality, etc. Thanks goes out to The Introvert Files! This is long, but I won’t apologize. You have been warned! In my defense, there’s a lot of words in my head that need to get out since I haven’t been blogging regularly. Habits are mostly good to have. I’m a creature of habit. I’ve written about it in the past, so I won’t dwell on the subject. Blogging is a good habit for me to have, but I’m finding that it’s also a habit that is, unfortunately, easily broken. Life has been busy since the holidays with no sign of letting up. That’s okay, though! Keeping busy is usually good for me because it keeps me from getting back into bad habits, like snacking, staying up too late or sleeping too much when it’s not night time. Those things usually trigger depression, which I have still been battling lately, as well. So thoughts have been forming in my mind, but I just haven’t taken the time to get them out of my head. They’re mostly random thoughts and not very lengthy, so they end up in my personal Facebook, but I should probably be sharing them in my Blog Facebook, as well. Oddly enough, there’s several thoughts that I will post in this blog instead of on Facebook, even though this blog is public. I guess I feel that my blog is more of a selected audience, and the people who take the time to read it should be “treated” with something a little more…I don’t know…special? What’s been going on with me? You know, New Year’s Resolutions and all, those things that I say that I don’t make but subconsciously I do? I guess as long as I don’t write them down, I don’t feel the guilt of failure if I don’t succeed. I have been trying to get back into working out. I started slacking in October, so I’m jumping back on now. 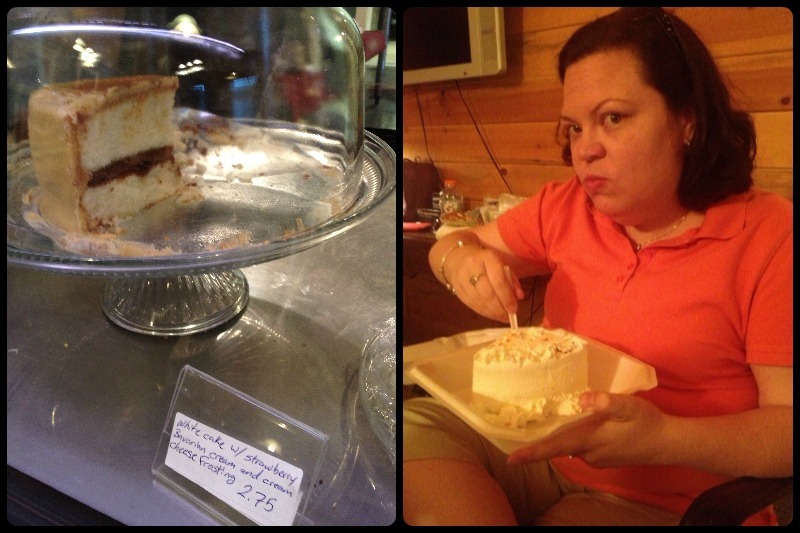 I have no doubt that the lack of exercise and reverting back to bad eating habits is what has slowed my weight loss. I maintained pretty much the whole month of December and half of January. I’m not complaining, but maintaining is not where I want to be. I did that for many years already! Shortly after the New Year, I decided to go for a Couch to 5K plan (C25K) and found an app on my phone to help me. I’ve tried jogging in the past and didn’t get very far with it. This time I’m trying it on a treadmill so that I HAVE to jog or fall flat on my face since the belt is moving that much faster. I started on Monday, January 7th and felt incredibly accomplished after finishing the first day! I was feeling so accomplished that I decided to do a little strength training afterward. I did a few sets on a few machines and was on the last one before it was going to be time to head to the showers. IT was the Compound Row – one of my favorite machines! I can row like nobody’s business, doing 2-3 sets of 50. I was halfway through a second rep when I felt my back seize up and OMG THE PAIN! I had a disc in my lower back rupture in 2005 that caused tremendous pain for about 6 months, as well as nerve damage to my sciatic nerve. I had back surgery that year, which cured the worst of the pain, but I have about 2-4 flare ups a year. This was one of those flare ups. By Wednesday, the pain was excruciating, so I went to the doctor, and she referred me to the spine clinic. I don’t know why I never looked into it sooner since I have had had major surgery on my back, but meh…that’s here nor there now. The pain had mostly subsided by the following Monday, so I went for Day 2 of the C25K, and had an appointment with the spine clinic that morning. X rays showed that I had no major damage but have some “arthritic changes” in my lower back, and the flare ups are common for people who have had back surgery like I have, usually due to scar tissue. The doctor wasn’t concerned that the disc had ruptured again but suggested that I try physical therapy to build a stronger core in the hopes of lessening the frequency, duration and level of the flare ups that I am bound to experience. Yesterday was Day 3 of the C25K, which technically wraps up the first of 8 weeks, even though my first week was split up into 2. I’m getting up at 4:30am MWF to get to the gym to do this. I am SO not a morning person! Yesterday was also my physical therapy consult. I’ll be doing that 2 days a week for at least a month. I’m also going to water aerobics on Thursdays after work, and also planning to meet a group of post-op weight loss surgery people twice a month on Saturdays.